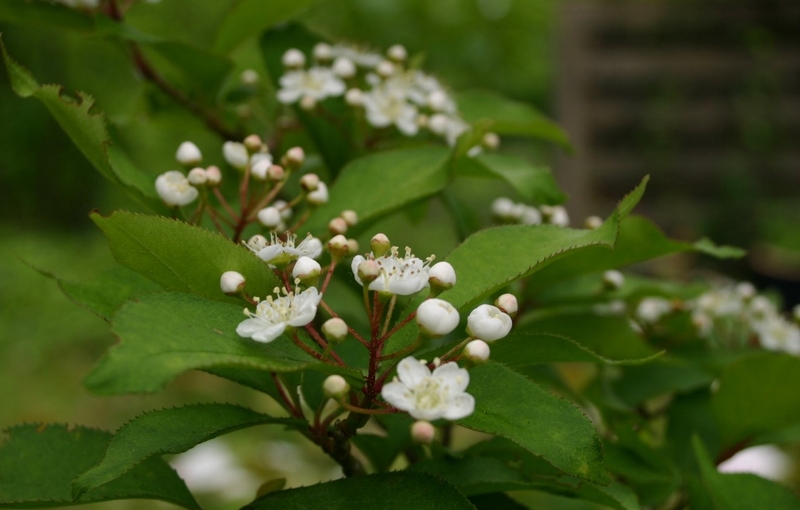 Photinia villosa is a shrub or small tree, young twigs finely hairy. Leaves alternate, stalk to 0.5 cm long, blade 3-8 cm long, reverse egg-shaped (obovate), widest above middle, tip long-pointed, base wedge-shaped, veins 5-7 pairs, dark green above, wooly-hairy below, margin finely, sharply toothed, teeth dark or broad-tipped (use lens); autumn foliage orange-red; winter buds with several scales. Flowers white, about 0.8 cm wide, radially symmetrical, stamens prominent (more-or-less typical of Rosaceae), petals 5, round; inflorescences of branched clusters to 5 cm wide; blooming May-June. Fruit bright red, fleshy, 0.8 cm, Oct. somewhat persistent (Dirr 1990).